Traci Austin---Won US Open at 16 in 1979, the youngest ever to do so. Had a short but eventful career. Jennifer Capriati---A top contender to the Williams sisters, she has never managed to win a Wimbledon but has come dangerously close. Has won other major tournaments. Made a comeback after a much publicized drug problem in the early 1990's. 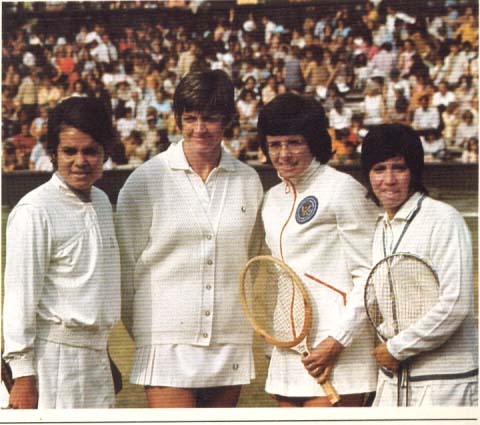 Rosie Casals---A protege and playing partner of Billie Jean King, they won five Wimbledon and two U. S. Open titles together. 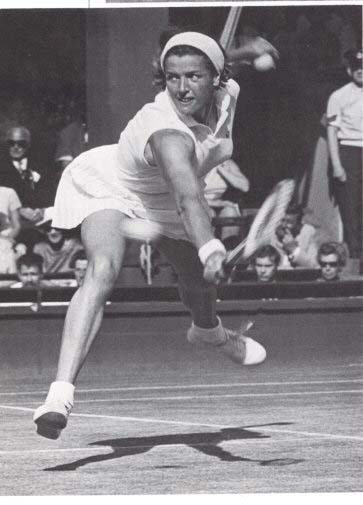 Margaret Court---The most proflific winner of major championships, winning 62 singles, doubles and mixed between 1960-75. Won all four Grand Slam in 1970. Only player to win doubles and singles slam. Known as "The Arm", a phrase coined by Billie Jean King, she was known for her incredible reach. 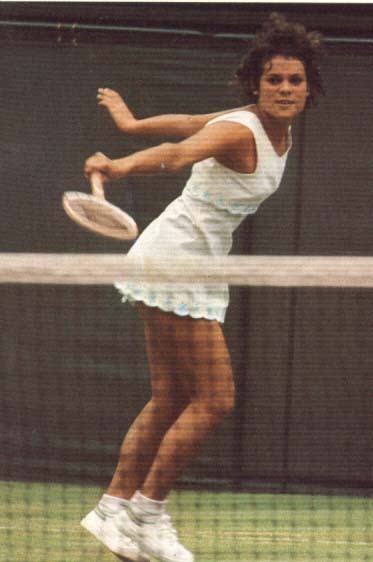 Her greatest triumph was beating King in 1970 with a sprained ankle. Perhaps Billie started calling Margaret "The Ankle". Wimbledon singles titles 1963, 65, 70. Chris Evert---By the time she retired in 1989 she had won $8,896,195 total in prize money over 20 years and 17 pro singles titles on a 1, 309-146 win-loss record. That amounts to a .8996 average. The highest in history! 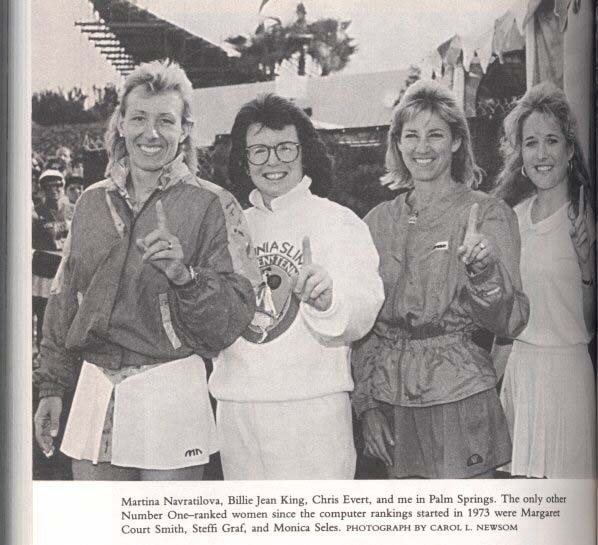 Although Martina Navratilova overtook her in victories, Evert is still runner up. Evert was the first to reach 1 million in prize money. Her first great rival was Evonne Goolagong, starting in an exciting 1972 Wimbledon match. Her most notable rival though was Navratilova, they played each other more than five times in the Wimbledon finals, the eighties two greatest players. Wimbledon singles titles 1974, 76, 81. Evonne Goolagong---Her carefree personality captived many who have seen her play. Known as Sunshine Supergirl in London, she had speed and lighting reflexes. A native Australian, she was discovered in the bush and brought to a school in Sydney. 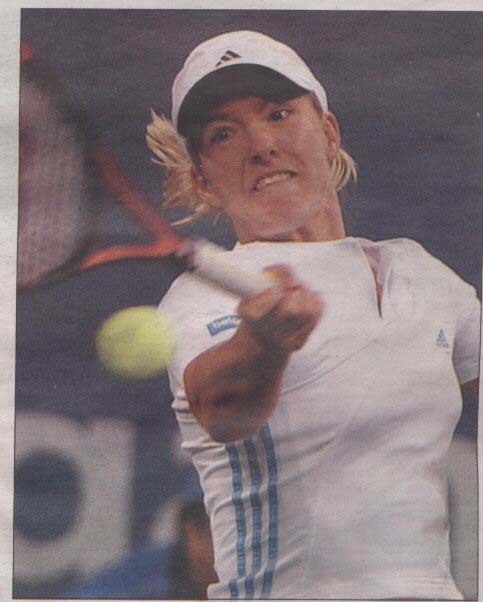 Rivalry with Chris Evert. Won Wimbledon twice, nine years apart. Wimbledon singles titles 1971, 80. 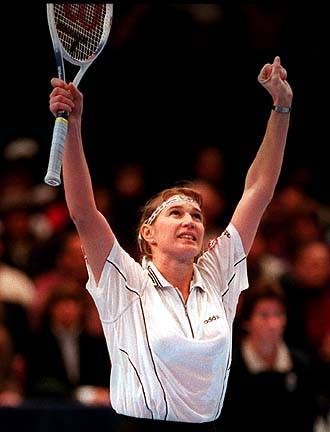 Steffi Graf---Second greatest women player behind Navratilova, won Wimbledon seven times. Greatest rival was Monica Seles. Wimbledon singles titles 1988, 89, 91, 92, 93, 95, 96. Justine Henin-Hardenne---the great up and coming player has already won the French open, a dream come true said Justine the Belgian. Will be one of the most dominant players in the next five years. Martina Hingis---The other Martina, a top player of the mid to late 1990's announced her retirement in 2003. Billie Jean King---The all-time Wimbledon champion. Won the most titles in singles and doubles combined. A million-plus dollar winner on the women's tour and a crusader in building the female professional game. Started the Virginia Slims tour with Rosie Casals, which established women in making their own prize money to equal the men. 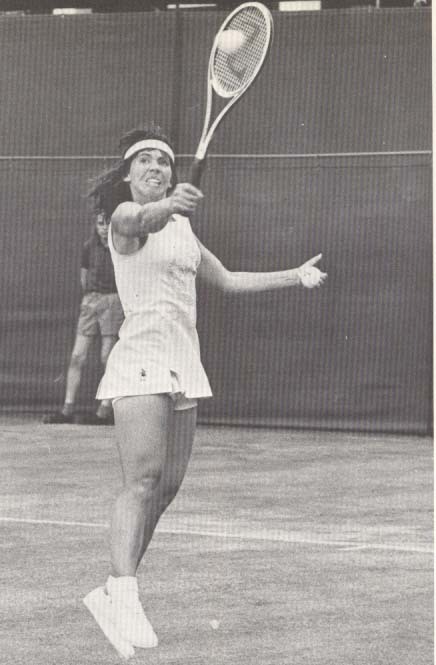 Played male legend Bobby Riggs in 1973 in the "Battle of the Sexes". Wimbledon singles 1966, 67, 68, 72, 73, 75. Martina Navratilova--- The games' most prolific winner ever, the left-handed player won Wimbledon nine times, more than any other player. Major rivalry with Chris Evert who she played in many finals. Wimbledon singles titles 1978, 79, 82, 83, 84, 85, 86, 87, 90. Gabriela Sabatini-Called the "Divine Argentine", she had a powerful topspin, was a groundstroker, showed attacking qualitites to win U.S. Open 1990, over Steffi Graf, reached Wimby final in 1991. 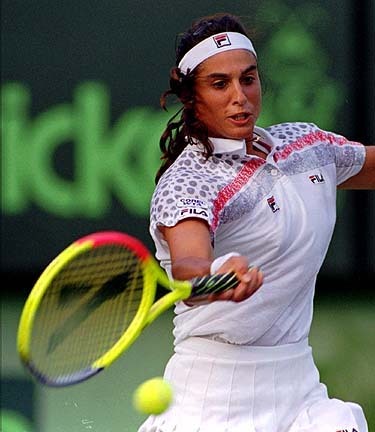 Monica Seles---Another great player of the late eighties and early nineties, was a top ranked competitor, a rival to the queen of the time, Steffi Graf. Endured a horrible on-court stabbing by a crazed spectator in 1993. She returned better than ever. Venus and Serena Williams---What can be said that already hasn't been said? A double threat for the players today. They seem unbeatable, even having played each other in more than one major final. Have a lock on the Wimbledon title for the past four years. 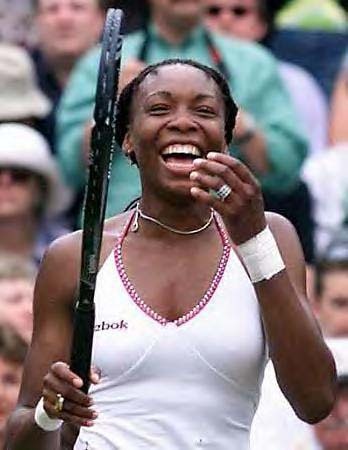 Wimbledon titles 2000, 01 (Venus), 02, 03 (Serena).